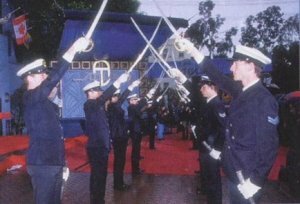 In 1967, L. Ron Hubbard raised a private navy, appointed himself Commodore, donned a dashing uniform of his own design and set forth on an extraordinary odyssey, leading a fleet of ships across the oceans variously pursued by the CIA, the FBI, the international press and a miscellany of suspicious government and maritime agencies. 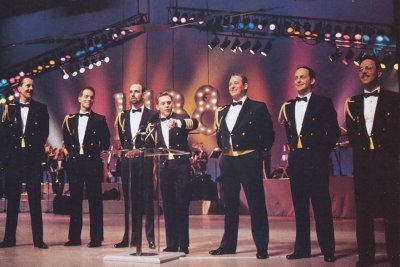 The Sea Organization is the actual nexus that controls the scientology empire. 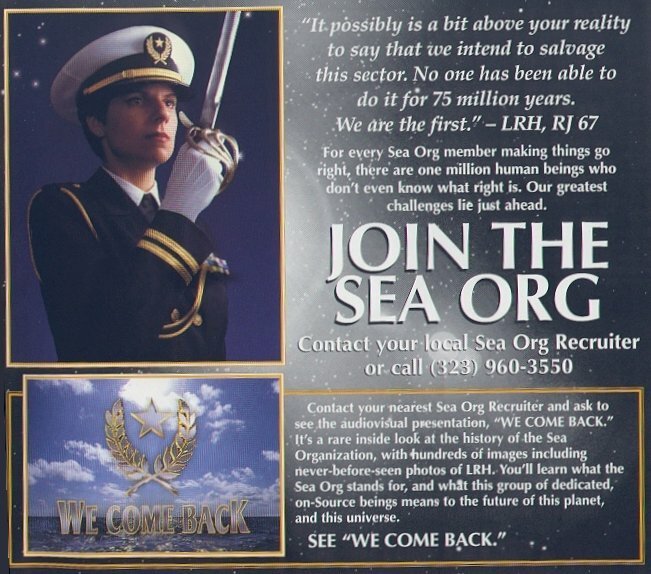 Sea Organization personnel are authorized to take over and control scientology organizations and to demote personnel, move bank accounts and run the corporation as if the SO personnel were employees or representatives of that corporation but they are not. While busy "researching" OT3 Hubbard was kicked out of Rhodesia in 1967 and flew to Las Palmas. In a letter to his third wife Mary Sue he writes "I'm drinking lots of rum and popping pinks and greys." People who cared for him at the time say they were astonished that he was existing "almost totally on a diet of drugs" and obsessed with removing his body-thetans (BTs). BTs are confused spirits of space aliens killed on earth 75 million years ago. They cling to human bodies and can only be exorcised by applying Scientology. Hubbard appointed a special crew on the ship the Enchanter and called it the Sea Project. The British government started an investigation into Hubbard's activities and he needed a plan to escape the authorities. Lots of money was at this point transferred to Hubbard from the Church of Scientology. 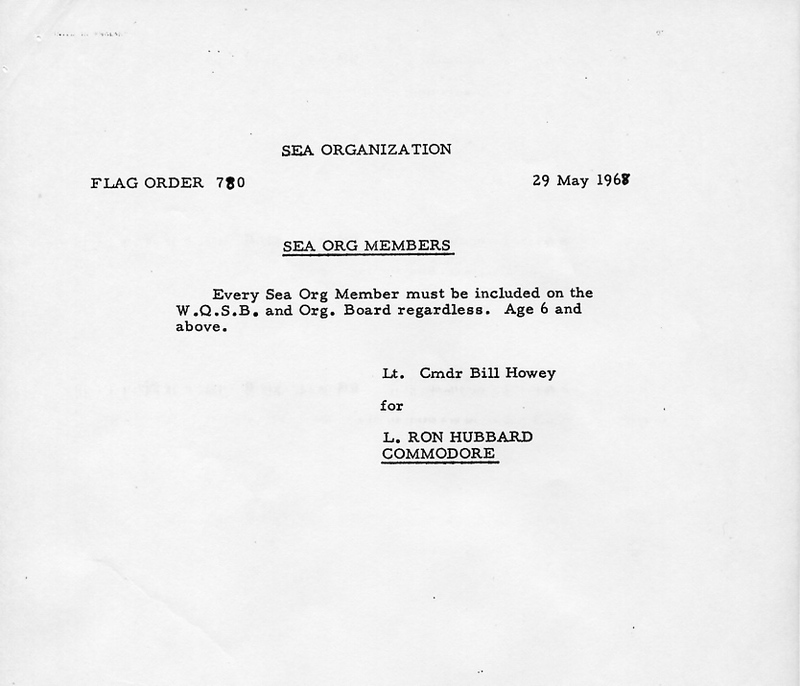 The Sea Project became the Sea Organisation (today also known as Sea Org or just SO). While on Las Palmas Hubbard finished off OT3 and called it "the Wall of Fire". Hubbard claimed: "The material involved in this sector is so vicious that it is carefully arranged to kill anyone if he discovers the exact truth of it...I am very sure that I was the first one that ever did live through any attempt to attain that material." Sea Org members got exited about the OT3 discovery as the news spread. Hubbard was going to use the Mothership to escape from Earth. The ship was protected by atomic warheads. It awaited the return of a great leader, and there were rumors about a "Space Org." Soon after, Hubbard moved with his top Aides to the Royal Scotman, which became the Flagship of the Sea Org fleet. Scientologists called it simply "Flag". In 1968 Ethics was introduced in Sea Org. Crew were put into a chain-locker as punishment. A chain-locker is "a dark hole where the anchor chains are stored; cold, wet and rats," to quote one ex-Sea Org officer. A crew member that was put on ethics could spend up to two weeks in the tiny hole. Former Scientologists who served as crew together with Hubbard in the early years remember a five years old deaf and mute child being locked up in the chain-locker. Hubbard said she was not to leave the chain locker until she completed the formula by writing her name. Another witness claims that a three-year-old was once put in the locker. Hubbard published the purpose of the Class VIII course: "It's up to the Auditor to become UNCOMPROMISINGLY STANDARD... an uncompromising zealot for Standard Tech." 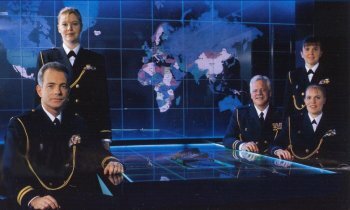 Sea Org "Missions" were dispatched to all corners of the world to bully Org staffs into higher production. Hubbard pronounced that such "Missions" had "unlimited Ethics powers." Click on image to view the unique television interview by Granada Television in 1968 of Hubbard on The Royal Scottsman. In the Advanced Orgs in Edinburgh and Los Angeles, staff were ordered to wear all-white uniforms, with silver boots, to mimic the Galactic Patrol of seventy-five million years before. According to Hubbard's Flag Order 652, mankind would accept regulation from that group which had last betrayed it. So the Sea Org were to ape the instigators of the OT3 incident. By the same token, all the book covers were revised to show scenes from the supposedly lethal incident. "Captain" Bill Robertson, who introduced the uniforms to both Edinburgh and Los Angeles, also ordered a nightwatch in Los Angeles. The crew assembled on the roof every night to watch for the spaceships of Hubbard's enemies. 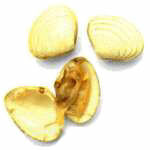 Soon afterwards, an Inquiry started in South Africa. Hubbard turned his back on the "wog" world, and concentrated on introducing a new form of Dianetics, and integrating it into the Scientology "Bridge." He issued a bizarre order to the Sea Org, called "Zones of Action," which outlined his plans. 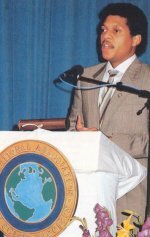 Scientology was going to take over those areas controlled by Smersh (the fictitious evil organization fought by the equally fictitious James Bond), rake in enormous amounts of cash, clean up psychotherapy, infiltrate and reorganize every minority group, and befriend the worst enemies of the Western nations. Hubbard's stated intention was to undermine a supposed Fascist conspiracy to rule the world. 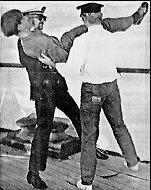 Student being thrown overboard for gross "out tech"
throwing violators of Hubbard's rules over the side of the ship ("overboarding" them) became a Sea Org tradition. Usually they were thrown off the tween (second) deck, but there were a couple of occasions when they went off the promenade deck (some 25 feet above the water). 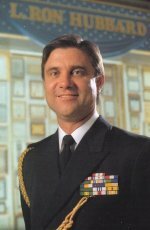 There were rules written by Hubbard in a "Flag Order" which listed orders of severity of overboarding, such as: from which deck, should the person be blindfolded, and should his hands or feet be tied. At first the relationship with the military junta in Greece went well, but when Hubbard published an article about democracy in a Greek newspaper he was ordered out in March 1969. It would appear that Hubbard also, in fact, had little appreciation for the idea of democracy. He had written in 1965 "And I don't see that popular measures, self-abnegation and democracy have done anything for Man but push him further into the mud... democracy has given us inflation and income tax." He had already been kicked out of Hull in England, and when they tried to pull into Gibraltar they were denied entry there, and then later there was also some mess in Spain. So Hubbard decided to disconnect from land and go out and float for as long as the emergency stores would last and just get the scene together. They did that for about two months off the coast of Morocco. During this "disconnection cruise" Hubbard had a heart attack on the bridge. Do you recall talking to me about WW III - and where it would start if it were to start - father and most everyone else maintained that it would start in either China or Russia vs. U.S. and you said - oh no - it would originate in Germany - that the Nazis hadn't given up yet - ? Well babe, you were right - there is a new Nazi resurgence taking place in Germany - so now it's a race between the good guys in the white hats (Scientologists) [sic] and the Leipzig death camp (Nazis) [sic] the bad guys in the black hats - we'll win of course - but the game is exciting. Truth is stranger than fiction. As Alice [in Wonderland] says "Things get curiouser and curiouser!" Get into Scientology now. It's fantastic. I feel great! Great GREAT! I can't tell you exactly where we are. We have enemies who are profiting from peoples' ignorance and lack of self-determinism and do not wish to see us succeed in restoring freedom and self-determinism to this planet's people. If these people were to find out where we are located - they would attempt to destroy us. Therefore, we are not allowed to say where this ship is located. She once more urged her mother to read Hubbard's books, and take Scientology courses. Ten days after writing the letter, Susan was dead. An Orders of the Day mentioning Susan Meister's boyfriend Amos Jessup. Dated two months after her death. Her father travelled to Morocco to see his daughter and bring her home for the funeral. But the body had curiously disappeared from the morgue. The local police showed him pictures of his daughter allegedly having shot herself onboard Apollo. It was a mystery how Susan could possibly have shoot herself in the center of her forehead with the long barreled revolver. She would have had to hold it with both hands at arms length. There were no powder burns on her forehead, which certainly would have been the case if the gun was against her forehead as it would have to be to shoot herself as the photograph appeared. Hubbard, who was onboard Apollo at the time, refused to meet with Susan's father, but upon departure back to America George Meister received a strange offer for settlement from the Apollo. When he refused he was threatened by strange men coming up to him at the airport saying "We are watching you and so are the CIA and the FBI." The body was eventually found and returned to the family, but before it arrived the local Health Authority, in Colorado, received an anonymous letter claiming there has been a Cholera epidemic in Morocco and this might be the cause of Susan Meister's death. It looked like a desperate attempt to stop further investigation into the cause of death. The Apollo crew went on establishing a land base, called the Tours Reception Center, in Morocco in 1971. 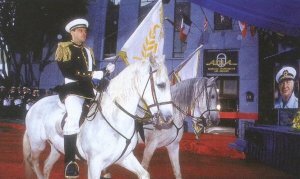 They were trying to get into the king's favor, and started training government officials, including Moroccan Intelligence agents, in Scientology techniques. Officials were put on the E-meter and Security-Checked by French-speaking Sea Org members. From his villa in Morocco, in March 1972, the Commodore explained his twelve point "Governing Policy" for finance. Points A and J were the same: "MAKE MONEY." Point K was "MAKE MORE MONEY." And the last point, L, was "MAKE OTHER PEOPLE PRODUCE SO AS TO MAKE MONEY." At last, an honest admission of this major plank of Hubbard's philosophy. The Apollo sailed from Morocco to Portugal in October, for repairs. Hubbard and a contingent of Sea Org members stayed behind. Morocco was as close as Hubbard ever came to having the ear of a government, but relations broke down. In the Scientology world, there is a rumor that the upset had something to do with Moroccan Intelligence, which does lend a certain mystique. A secret Guardian's Office investigation revealed a more prosaic error, however. In 1971, Hubbard had reintroduced Heavy Ethics, and Scientologists continued to use the Ethics Conditions. 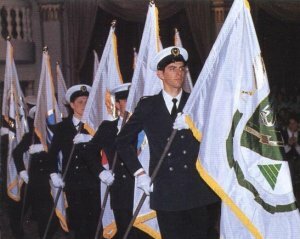 For being persistently late for their Scientology courses, members of the Moroccan Post Office were assigned a condition of "Treason." To the Moroccans, "Treason," no matter how much it was word-cleared, meant only one thing: execution. The Post Office officials set themselves against the Scientologists, and won. As a grim footnote, the Moroccan official who had negotiated with the Scientologists was later executed for treason. The contacts with Intelligence had actually been with a faction which was to fail in an attempted coup d'etat. The panic, starting from Hubbard's typically exaggerated use of a simple word, ended with an order for the Scientologists to quit Morocco, in December 1972. Hubbard himself was given only twenty-four hours. He flew to Lisbon, and then secretly on to New York. In November 1973, the Apollo was in Tenerife. Hubbard went for a joyride into the hills on one of his motorbikes. The bike skidded on a hairpin bend, hurling the Commodore onto the gravel. He was badly hurt, but somehow managed to walk back to the ship. He refused a doctor, and his medical orderly, Jim Dincaici, was surprised at his demands for painkillers. Hubbard turned on him, and said "You're trying to kill me." Kima Douglas took Dincalci's place. She thinks Hubbard had broken an arm and three ribs, but could not get close enough to find out. With Hubbard strapped into his chair, the Apollo put to sea, encountering a Force 5 gale. The Commodore screamed in agony, and the screaming did not stop for six weeks. In Douglas' words: "He was revolting to be with - a sick, crotchety, pissed-off old man, extremely antagonistic to everything and everyone. His wife was often in tears and he'd scream at her at the top of his lungs, `Get out of here!' Nothing was right. He'd throw his food across the room with his good arm; I'd often see plates splat against the bulkhead... He absolutely refused to see another doctor. He said they were all fools and would only make him worse. The truth was that he was terrified of doctors and that's why everyone had to be put through such hell." While on the mend, Hubbard introduced his latest innovation in Ethics Technology: the "Rehabilitation Project Force" (RPF). This became Scientology's equivalent to imprisonment, with more than a tinge of the Chinese Ideological Re-education Center. In theory the RPF deals with Sea Org members who consistently fail to make good. They are put on physical labor, and spend several hours each day confessing their overts (transgressions), and revealing their Evil Purposes.